During a subcommittee hearing this week, Congresswoman Linda Sanchez (D-CA) expressed her opposition to repeal the estate tax, better known as the death tax. 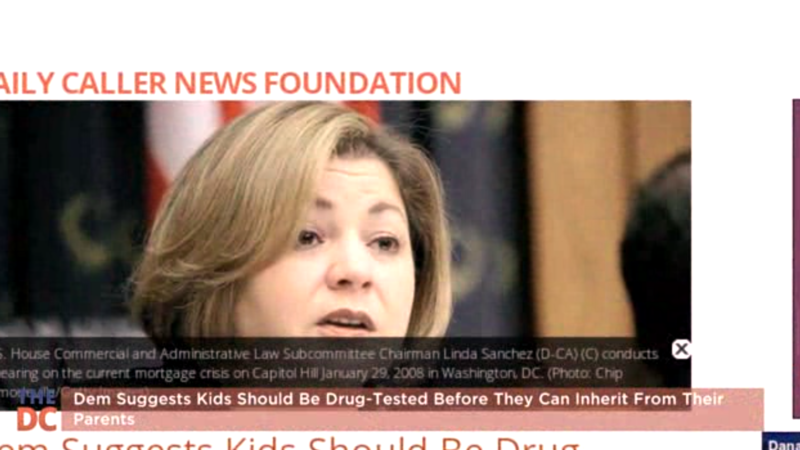 Sanchez suggested, among other things, that prior to receiving an inheritance, children should be drug-tested since people on food stamps are required to meet work requirements or be drug tested. Sanchez’ comments are ridiculous. There is no relationship between these two issues — family inheritance and individuals on public assistance. Because individuals on public assistance are receiving tax-payer money, they should be obligated to use the money as intended but most importantly, find a job to support themselves. Sanchez, exposing her liberal views, wants to punish the wealth creators because they have wealth. Some of these individuals took risks and invested in their business which provided jobs. Moreover, taxes have already been paid. An inheritance is a private matter between family members and the owner should have the right to keep the business in the family and not be subjected to a death tax. Family farms and small businesses are often forced to liquidate their business just to pay the death tax which means family members end up unemployed. The death tax is highly unpopular and should be repealed which would spur job creation and grow the economy. Sanchez’ comments illustrate that liberals have no concept of property rights.